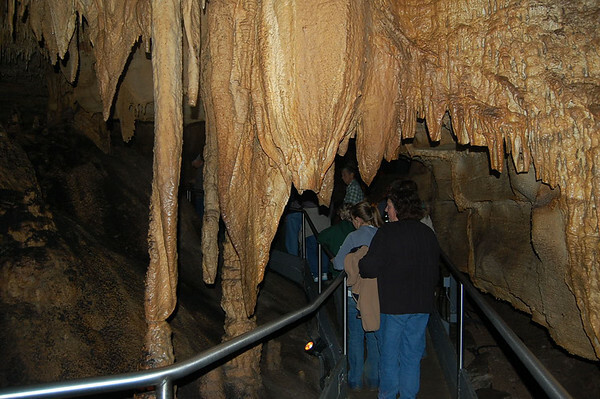 Mammoth Cave National Park is Kentucky's only National Park and it's worth a visit if you are in the area. 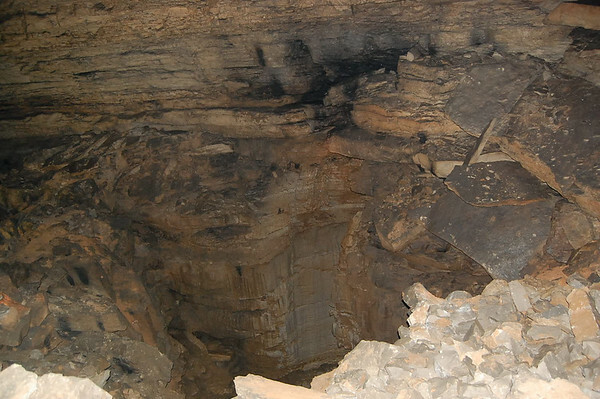 It's not the prettiest cave, but it is by far the longest continuous cave system in the world. 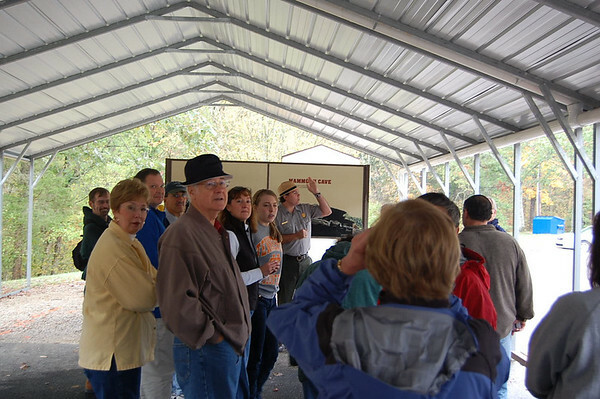 There are several tours available, but the Grand Avenue Tour encompasses a few of the other tours. Note, however, that the Grand Avenue Tour is more strenuous than other tours, and it's four hours or more, so it's not for everyone. Today we were doing a cave tour at Mammoth Cave National Park in Kentucky. Our tour started at 10:30 this morning. Well, we arrived just a little bit late and I rushed in and got tickets. 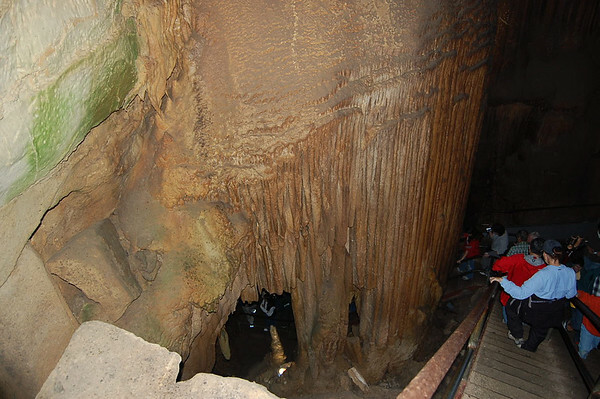 There are a dozen or so different cave tours that range from a half hour to six hours. We opted for the Grand Avenue Tour. It's a four to four and a half hour, 4 mile walk, that includes 670 steps, and some steep up-and-down grades. It's one of the more expensive tours, but it includes part or all of three other tours. Now, you can't take any type of bag into the cave. No purses, no backpacks, no fanny packs, no camera bags, etc. And the rules state that you must "demonstrate a need" to take any type of walking sticks. Linda pleaded her case to take her hiking poles. "Do you need them?" he asked, wink wink. She got the hint. "Yes, I do." I ran to the Jeep to get them and that of course made us the last people on the bus. Linda immediately sat down in the front seat and I sat next to her. Until I noticed the sign "Reserved For Rangers". Hmmm. Maybe that's why nobody else sat in the front seat. So we moved and Linda quickly became known as "The Troublemaker". That was her name the rest of the day. 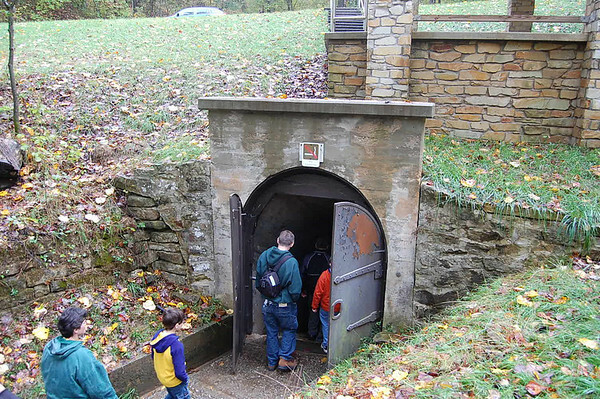 We took the bus to a different entrance than the "Natural Entrance" at the Visitor Center. 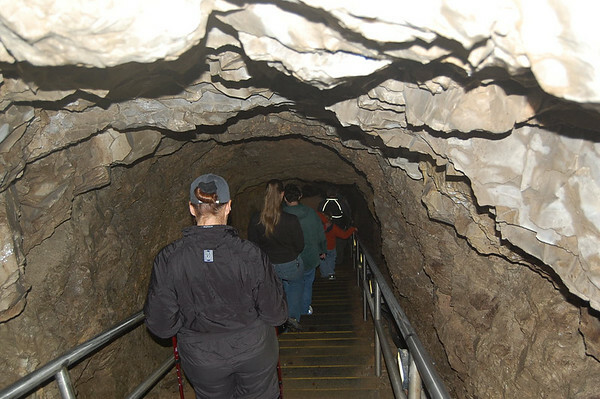 There are six natural entrances to the cave, but many of the tours start at entrances that were blasted in over the 191 years of tours. 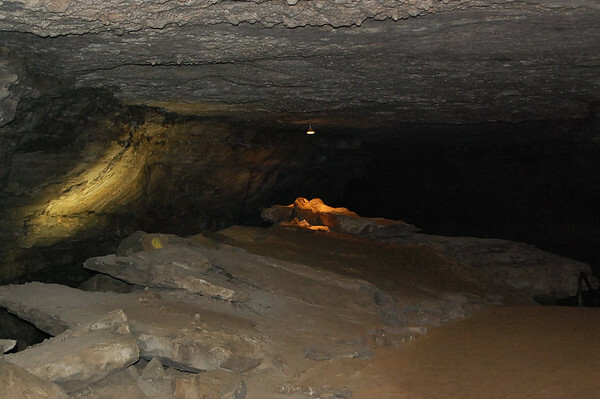 The property that is now Mammoth Cave National Park was previously owned by several owners. And some of the ones that owned land over the cave blasted entrances to cash in on the tourist trade. 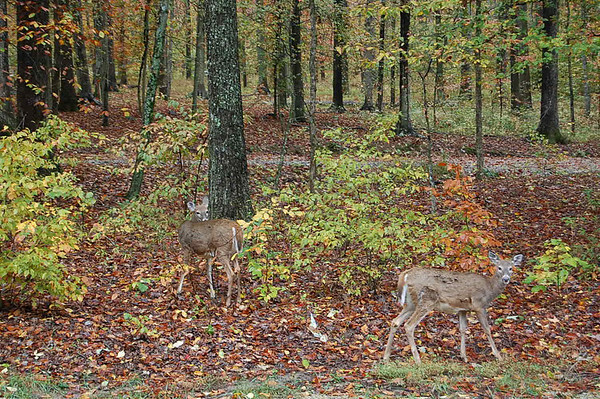 It was not designated as a National Park until 1941. 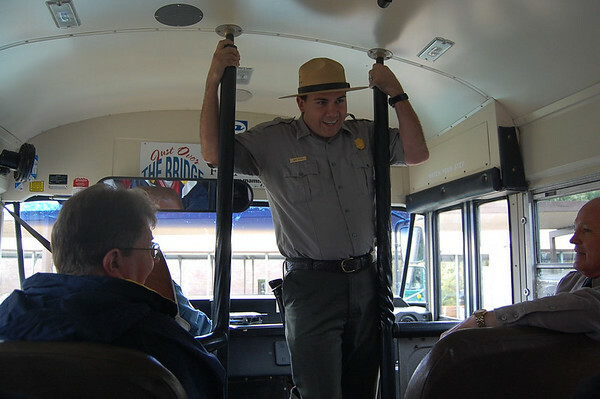 On the bus ride, we learned that there are 367 miles of connected passages at Mammoth Cave. That makes it the longest continuous cave in the world. 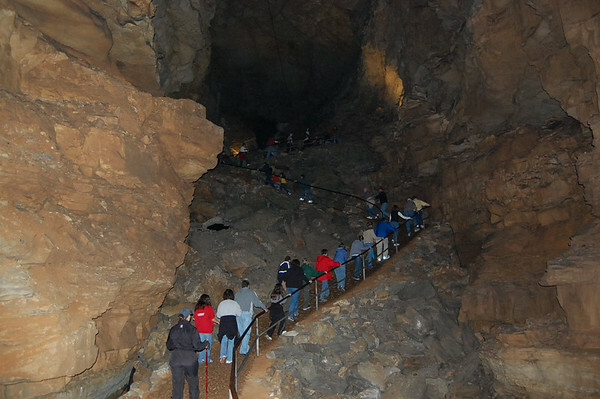 In fact, it is three times as long as any other cave and is 100 miles longer than the number two and three caves combined. and descended down lots of steps. Here is a shot back up the stairwell from the bottom. Now this is cave country and there are several smaller, more colorful caves in the area. 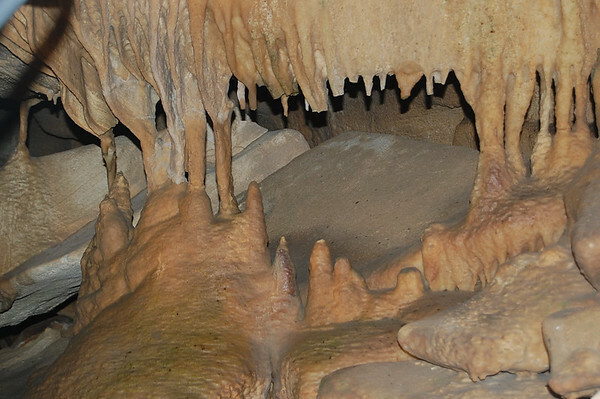 Here is a link to the listing of caves on the Cave City website. 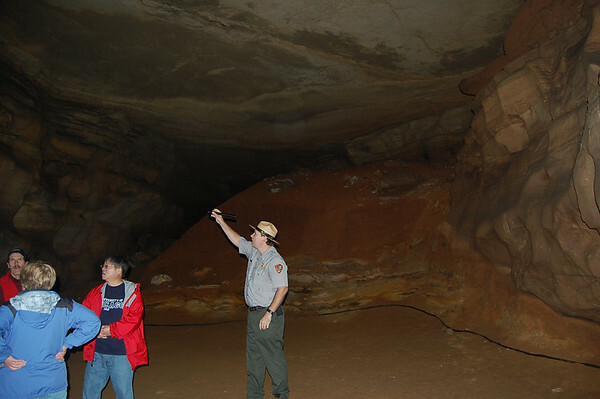 The American Cave Museum is also in the area. 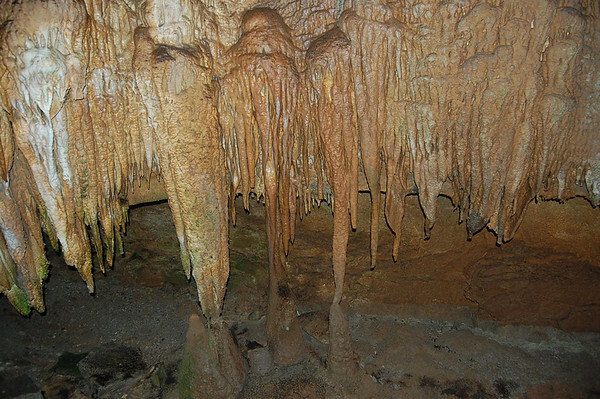 But Mammoth Cave doesn't have colorful minerals and it has very few formations. 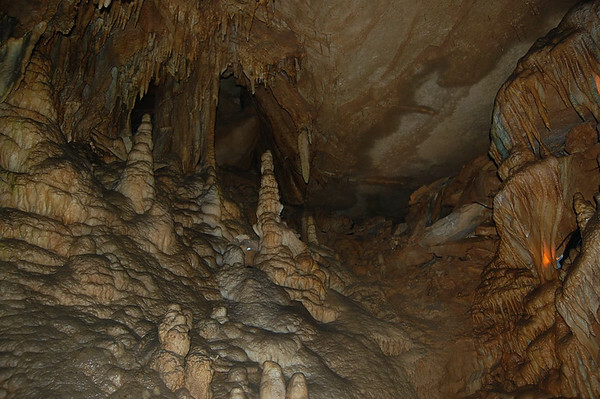 The whole cave is limestone, so it may not be the prettiest cave you have ever been in. 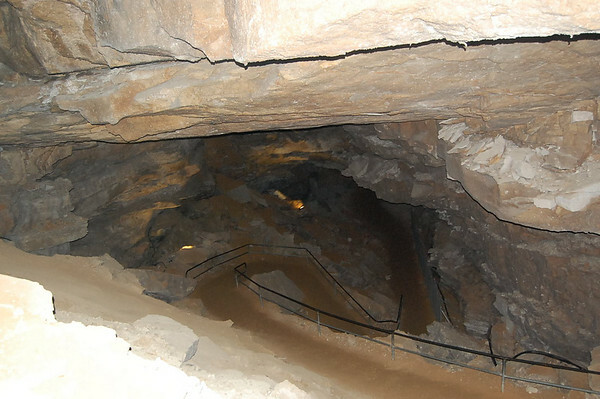 But the Cave has five levels and it is the size and the history that make it stand out. Here the ranger tells one of his many stories along the way. Now, it ain't easy getting photos in a cave and since everything is limestone, they ain't real purty either. But we'll share some anyway. Note: Flash photography may or may not be permitted depending on the tour. Here we stopped at "Bare Hole". A "passage" is a passage if a human can get through it. 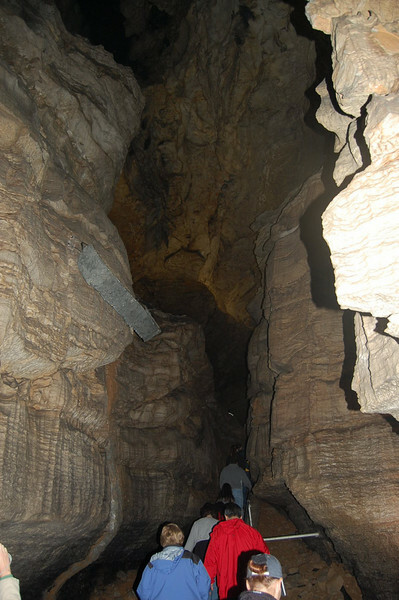 Bare Hole leads to a passage that is included on the Wild Cave Tour. That tour is long, requires some crawling and squeezing, and is limited to 14 people. That's a tour Linda would like, but it sells out quickly. Anyway, Bare Hole got its name because many years ago a gentleman got his pants caught squeezing through the hole and came out pants-less. In addition to large rooms, we went through long, narrow passages called "avenues" that were cut by underground rivers many years ago. We were on level 3 of the cave. 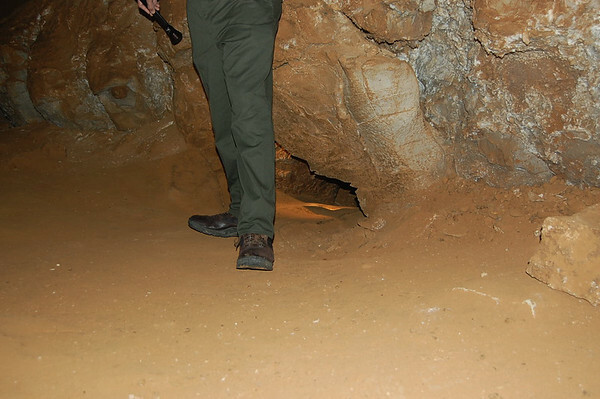 Rivers are still shaping the cave on level 5 below, but level 3 is now very dry and that's why there are no stalactites or stalagmites forming. This is one of the large pits we passed. Notice the black on the side of the walls. 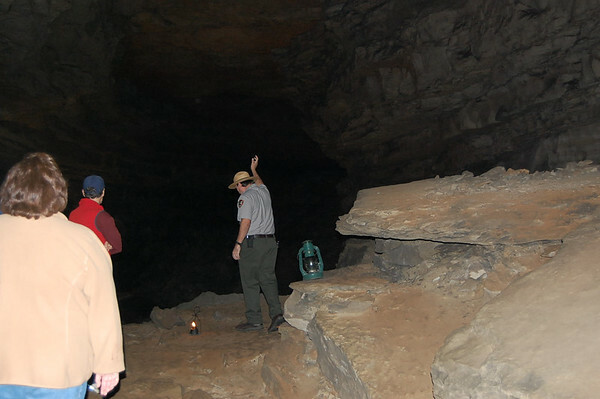 According to the ranger, the tour leaders used to toss lit torches in the rocks to light up the cave for tourists. The smoke from the torches blackened the walls. That practice continued until the 1990s. More shots of our group. We had 35 people in our group, but this tour will take up to 80. About a third of the way into our tour, we stopped for lunch and restroom breaks. You are not allowed to take food or drink (other than bottled water) into the cave, but they are happy to sell you a boxed lunch inside the cave. As we walked, there were several names and dates written on the walls. This one had a date of 1937. Irene Ryan played "Granny" on "The Beverly Hillbillies". 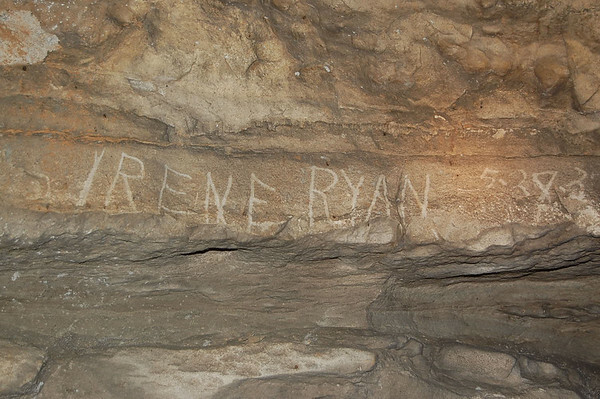 Graffiti became illegal once the cave became a national park in 1941. Here we are at a spot called "Fork of the Caves". 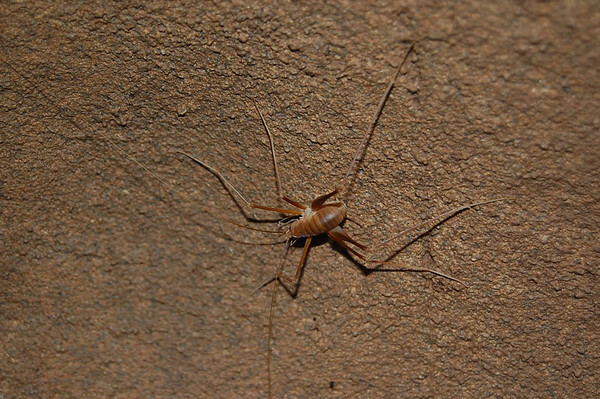 That was also the spot where I got this shot of one of the cave crickets. Here is a shot of one of the more strenuous climbs. There are three pretty steep hills or "heeeels" as our Kentucky-bred ranger called them. And the path was pretty slick in most places. Linda was glad she had her sticks, and those without sticks had to hold onto the handrails to keep from falling. Yep. This is the view looking back down from the top of that "heeel". This is the "Wishing Rock". Apparently it is a tradition that the guests get to rub this rock and make a wish. Then the rangers get a kick out of having everyone turn around and look back at the Wishing Rock. From a distance, it looks like a well-endowed sunbather, and everyone just rubbed one of her .... uh .... mounds. A rest stop at the top of another "heeel" in a dome room. We hung back at the rear of the group so Linda didn't accidentally whack anyone with her sticks and so I could take photos. It also gave the pics some good perspective. Linda makes her way through another narrow passage. Toward the end of the tour, we finally came upon some flowstone and some formations. Up to this point, they were not too strict about people touching the rocks or walls. But the rest of the way it was "hands off". This is the "Frozen Niagara". And here we have a shot in the "Drapery Room" below the "Frozen Niagara". Another view from above "Frozen Niagara" as we climbed back up and around. This was the start of a series of small formations. But the rest of them were protected from the nearby walking path by a thick wire cage. I didn't get a picture because of the wire, but it sort of looked like there should have been a sign: "Please don't feed the stalagmites". 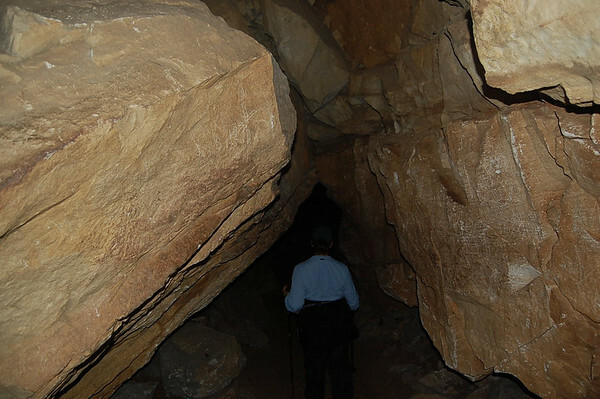 Okay, just a couple more shots before we exited this section of the cave. The ranger kept referring to the formations at the end of the tour as the "pretty stuff". It is where the tour slowed down a bit. Up to that point, except for lunch, a couple rests at the top of "heeels", and a couple bathroom breaks, we were walking through at a pretty good pace. Well, that wraps up our tour. We did really enjoy it. Okay. Now I am a Kentucky boy and I am supposed to brag about the attractions in my state. So here goes. 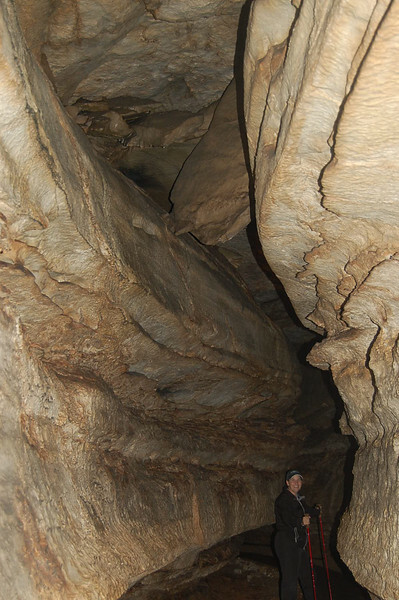 If you love caves, come to cave country and do all of them, even the touristy ones outside the National Park. 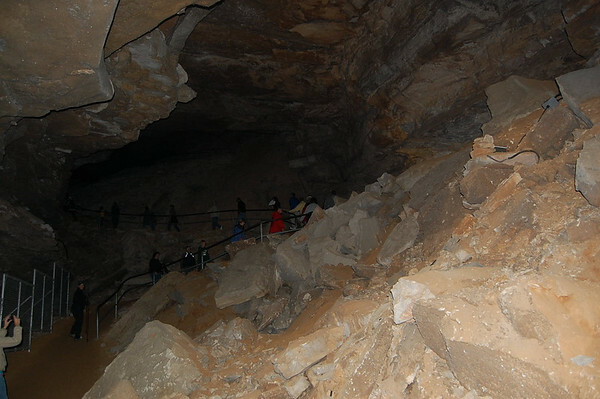 And be sure to do Mammoth Cave so that you can say you have been in the longest cave system in the world. It is impressive for sure. However, after that, if you want to be awestruck by formations and huge rooms, go to Carlsbad Caverns in southeastern New Mexico. Visually, it is absolutely spectacular! We did Carlsbad back in June of this year. Several times on that trip, we just stopped, looked around and were amazed by the natural beauty. 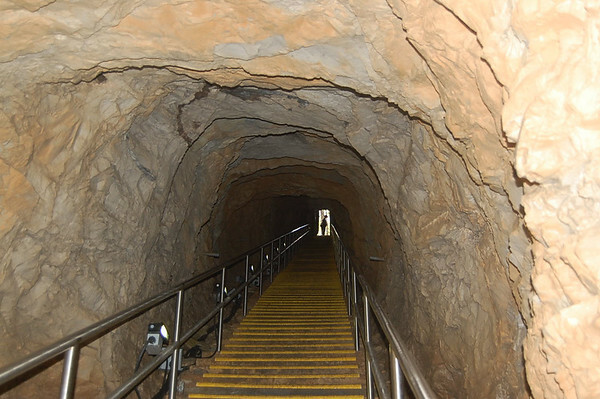 Even if you are not a big fan of caves, do yourself a favor and take in Carlsbad. In addition to the natural beauty, Carlsbad does a better job of lighting and a better job of hiding the lights and miles of cable. 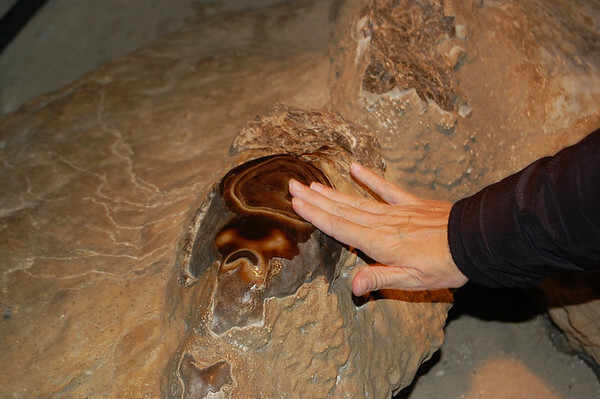 They are also more strict about touching anything, and they do a better job of requesting that everyone respect the quiet of the cave. I promise you will enjoy that experience. 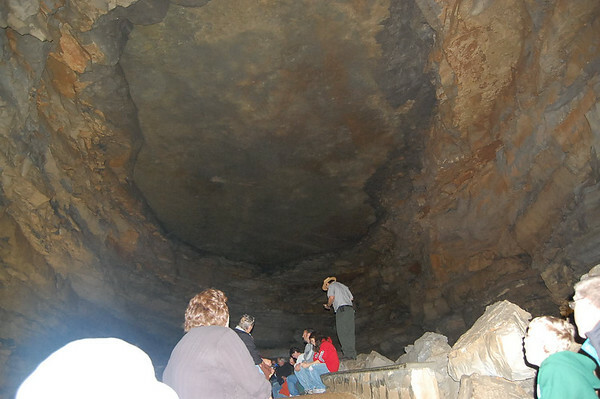 But if you do that before Mammoth Cave, you may be disappointed here because it is totally different. We exited the cave four miles from where we started, and there were cheers for the blue sky and sunshine that had appeared while we were underground. It had been raining for several days straight. 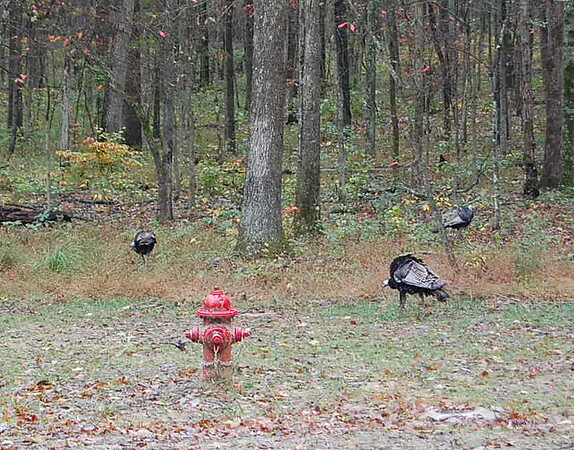 Every time I have been on the park road, I have seen deer and turkeys. 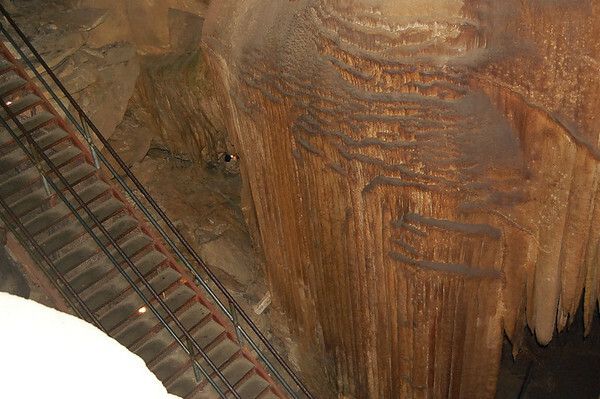 So, that was it for our tour of Mammoth Cave. Being Kentuckians, we've been here many times in the past and done a few of the other tours, but the Grand Avenue Tour covers just about anything you need to see.